The HR Series Hermetically Sealed Precision Wirewound Resistors were designed for applications requiring the highest resistance stability possible. By combining the inherent stability of the wirewound construction with extensive stabilization and a total moisture seal, the HR series offers a 3 year long term stability specification of .0025% maximum. HR-Series resistors are typically used in high accuracy instrumentation and as resistance standards. Resistance Range: 1Ω to maximum listed (see chart). Standard Tolerances: ±.1%, ±.05%, ±.02%, ±.01%, ±.005%;. Available to ±.0025%. Std Temperature Coefficient: ±5 PPM/°C. Available to ±1 PPM/°C over limited temperature ranges and for values over 100Ω. Ratio Matches: TC Matching to ±1 PPM/°C and/or Tolerance Matching to ±.002% are available. Operating Temperature Range: -55°C to ±145°C. Environmental Specification: Meets or exceeds the applicable requirements of Mil-R-93 and Mil-R-39005. Markings meet Mil-Std-130. 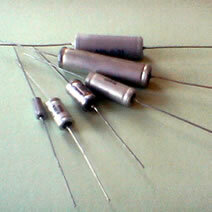 Lead Material: Standard leads are solder plated copper weld above 25Ω , solder plated copper for 25Ω and lower. End Seals: Pyrex disks chemically bonded to metal flanges. Disks are silicone treated to provide resistance to environmental characteristics. Case: Electro-plated brass tubing with support rings. Outer insulation protection available. Long Term Operating Stability: ±.001% for 1 year: ±.0025% over 3 years, when operated within the wattage and ambient temperature limits of the .0025% derating curve.